Jerusalem artichokes have no relation to Jerusalem; they actually come from Italy instead. 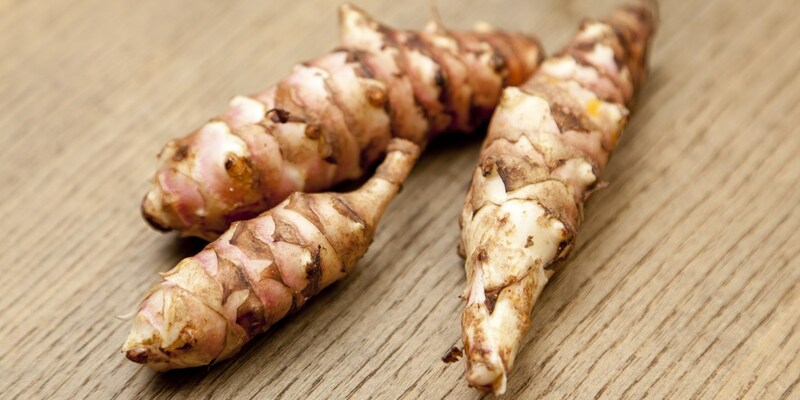 Also, they're not to be mistaken for globe artichokes - rather, Jerusalem artichokes bear a greater resemblance to ginger roots, or nobbly potatoes. They are harvested from October through to March. Jerusalem artichokes are deliciously sweet, crunchy and nutty and are a sources of B vitamins thiamin and niacin, and iron. When shopping for the tubers, choose the less nobbly ones for ease of preparation, and use them much as you would potatoes or other root vegetables. Browse our delicious Jerusalem artichoke recipes, including Mark Dodson's sea bass with Jerusalem artichoke purée, roasted garlic and red wine, Geoffrey Smeddle's Jerusalem artichoke pizza and Stephen Crane's Jerusalem artichoke soup recipe.